Radio frequency process heating and drying equipment can be conveniently described as a power supply, or generator, delivering power to an applicator or work circuit, which applies an electric field to the material to be heated. Traditional standard RF generators consist of a single valve (usually a triode) configured as a self excited ‘class C’ oscillator typically a modified Colpitts, tuned anode/tuned grid circuit. For valves to operate efficiently, a high DC voltage must be applied to the anode. This is produced from the mains three phase supply by a step-up transformer and full wave rectification. Power is drawn by the work circuit from the oscillator circuit through mutual inductance coupling, similar to the windings of a transformer, where the tuned oscillator circuit is the primary winding and the work circuit is the secondary. Typical RF generators have a conversion efficiency of about 70% between mains supply and RF power output and single generators producing over 100kW are available. How much of this is transferred to the product depends on a number of things including the design of the applicator, the degree of optimisation of the coupling and by the product presentation in the applicator. Consequently it is not necessarily easy to use a radio frequency heater as a general purpose unit. Triode valves are either air or water cooled and are still widely available. Brand new valves will typically last in excess of 15000 hours in a well maintained RF generator. Solid state generators are now also available for special applications in the semiconductor industry. 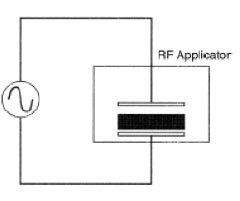 Radio frequency applicators are essentially capacitors, which contain the product requiring heating as the whole or a part of its dielectric. The simplest and most widely used is the through field or parallel plate electrode as shown in Figure 1. Such a system would be used in a press, for example in plastics welding or wood gluing, in which case there would be no air gap. However, when used for drying like in a textile dryer, an air space is required above the dielectric to allow for the movement of the product through the machine and for removal of the water vapour. This then means an increase in voltage between the plates in order to maintain an adequate field strength in the product. It is therefore important to consider the relative dimensions of the dielectric and air space capacitors to give the desired heating effect without an electrical discharge taking place. For very thin materials such as paper it may be necessary to use an alternative electrode configuration. Several other configurations are available for when the product dimensions or other factors make the use of the through-field system undesirable. These include the fringe field, also known as the stray field array shown in Figure 2 which is used in the processing of thin sheets and webs typically in the paper industry. 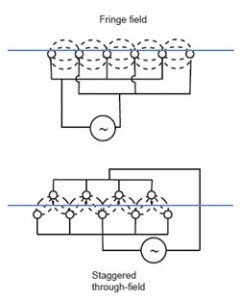 Another variant is the staggered through-field, also shown in Figure 2 in which the rods are arranged above and below the product. The best known application of this arrangement is in the post baking of biscuits. These latter two arrays require that the product is transported through the applicator on a conveyor belt in order to achieve uniform heating.